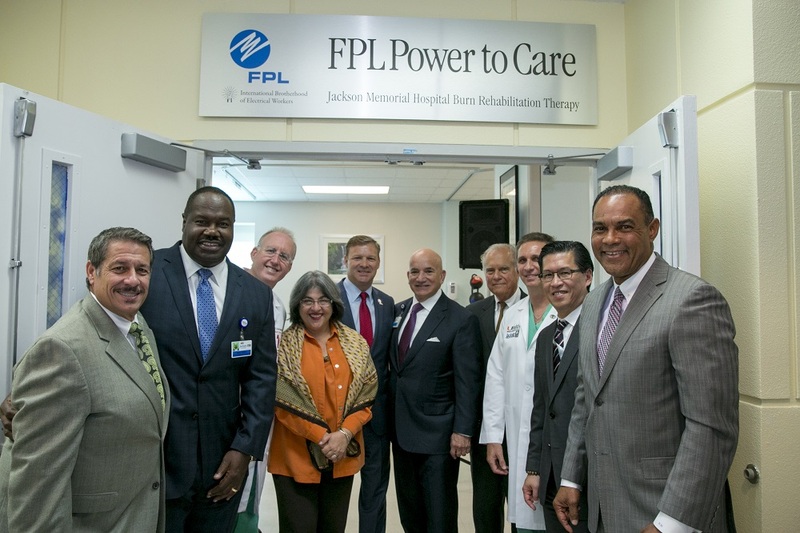 MIAMI, Fla., July 27, 2017	(Newswire.com) - Current and former patients recently helped unveil the renovated Florida Power & Light Company Power to Care Jackson Memorial Hospital Burn Rehabilitation Therapy Unit thanks to a $500,000 donation by Florida Power & Light (FPL) to Jackson Health Foundation, the fundraising arm of Jackson Health System. Former burn patient Chris Rotella attended the unveiling, and shared his amazing story of survival. In July of 2016, Rotella and a friend were working on a 34-foot cabin cruiser in a canal in Fort Lauderdale when the boat suddenly exploded. Rotella suffered burns to 60 percent of his body and was rushed to the University of Miami/Jackson Memorial Burn Center at Ryder Trauma Center. Rotella received extracorporeal membrane oxygenation, a treatment commonly referred to as ECMO, in which a machine takes over the work of the lungs and the heart to allow those organs time to rest and recover. He spent 30 days in the burn intensive care unit. Rotella spent weeks receiving inpatient and outpatient physical and occupational therapy at the FPL Power to Care Jackson Memorial Hospital Burn Rehabilitation Therapy Unit. "I feel great now. I am still in pain. I still have thoughts of the accident," said Rotella. "I'm very lucky to be alive. I'm very appreciative of everything and everyone at the Burn Center." Since the renovations were completed last summer, the FPL Power to Care Jackson Memorial Hospital Burn Rehabilitation Therapy Unit has served close to 400 patients. "Florida Power & Light has played a major role in turning this renovation project into reality," said Carlos A. Migoya, president and CEO of Jackson Health System. "Thanks to FPL's support, we can continue to improve our Burn Center, and ensure that all residents of Miami-Dade County receive the best quality care available." Located at the world-renowned Ryder Trauma Center, the Burn Center provides patients with burn care ranging from the resuscitation phase through long-term rehabilitation. The renovated unit features new therapy equipment including parallel bars, trampolines and exercise equipment that is used to enhance treatment for patients. The renovated unit is South Florida's only Burn Center verified by the American Burn Association and American College of Surgeons. "All of us at FPL are extremely proud to partner with this wonderful facility to ensure the community has the access to world-class medical care, particularly in the area of burn management," said Eric Silagy, president and CEO of FPL. "Burns have long-lasting and often life-changing effects on people's lives. As a provider of essential services ourselves, we understand all too well the need for prompt medical intervention. This state-of-the-art burn rehabilitation unit will provide the platform from which lives will be saved, and we're pleased to be associated with this effort." "We are honored to have FPL as a partner and are appreciative of their commitment to our community," said Keith R. Tribble, president and CEO of Jackson Health Foundation. "This unveiling is a great example that demonstrates how the power of philanthropy continues to fuel the extraordinary growth currently taking place at Jackson." Jackson Health System is a nonprofit academic medical system offering world-class care to any person who walks through its doors. Governed by the Public Health Trust, a dedicated team of citizen volunteers acting on behalf of the Miami-Dade Board of County Commissioners, Jackson Health System ensures that all residents of Miami-Dade County receive a single high standard of care regardless of their ability to pay. An integrated healthcare delivery system, Jackson Health System consists of its centerpiece, Jackson Memorial Hospital; multiple primary care and specialty care centers; two long-term care nursing facilities; six Corrections Health Services clinics; a network of mental health facilities; Holtz Children's Hospital, Jackson Rehabilitation Hospital, Jackson Behavioral Health Hospital, Jackson North Medical Center and Jackson South Community Hospital. Jackson Health Foundation, a 501(c)(3) organization, is the fundraising arm for Jackson Health System, the most comprehensive healthcare provider in South Florida. Through the generosity of compassionate donors, the Foundation financially assists Jackson Health System in providing world-class medical care to children and adults in South Florida and the global community, regardless of their ability to pay. Money raised by the Foundation helps fund major projects, special needs that cannot be financed by public support and projects of special interest to donors and philanthropists. Established in 1991, the Foundation is governed by a volunteer board of directors committed to philanthropic activities that benefit Jackson Health System. For more information please visit www.JacksonHealthFoundation.org or call 305.585.GIVE (4483).